DO-86403-13 was succesfully added to your cart. Do you qualify for a better price? Log in now! Available for sale in the United States and Canada only. console, integrated sensor suite, and mounting hardware. There maybe a few reasons why your weather station is malfunctioning. Please contact our Applications Department for further assistance. I'm relocating my Vantage Pro 2 from a post on the ground to my roof because my trees have grown up around it and now block sun and probably make rain measurements inaccurate. I'd like to keep the temperature/humidity sensor near the ground. Is it possible to use an extension cable on the temp/humidity sensor instead of buying the remote temp/humidity setup? You can use a cable. The length of the cable we sell is 25 ft. The item number is 00264PE. Do you have any information on what you are actually measuring with your solar sensors? Is see one is up to 1800W/m2, but is this GHI? What exactly is the measurement. Same for UV. Second, do you have an app note on how to convert that to dose against a vertical or horizontal plane at a certain latitude, etc. ? i have a 6162 vantage pro 2 wielrss uv/solar it worked with out any issues for about 3 years. the cr 123 battery went bad i thought so i changed it and the temp and rain amounts started working again. a week later the battery has failed again or the rain and wind info will not show up? is there a possible issue with unit or just a bad battery from store? If you are beginning to go through batteries quickly on your unit, that will typically signify a damaged transmitter. That can be replaced with part number 30003-52. I have a current unit setup at a test track site. Working fine. I need to have the unit calibrated every year. what do you recommend? How long upon receipt of unit at your facility can I expect to get it back with unit calibration certificates. Do you have loaner while mine is calibrated? Rick. 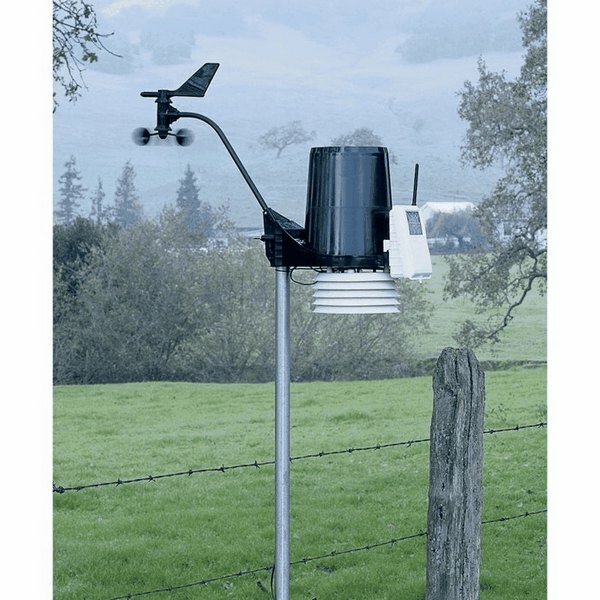 We can calibrate the weather station using service sku 17100-01. We do not have a loaner unit to offer at this time, and lead time on the calibration can vary based on demand. How can i download or transfer Data from the weather station to the computer? Software can be purchased for data transfer. What is diameter of the mounting hole? What size pipe is required for mounting? Asked on 5/28/2015 by Don from Bethlehem, Pa. The tripod pole and extension pole diameter is 1 5/8". Extension poles (34542-75) can be used with the tripod. I bought the wireless product 10 years ago and it is still working great. I unplugged my console from the transformer power source to move it into another room and I can't get it to reconnect. Can you please tell me what I need to do to, to get the console talking to the station again? Obstructions, particularly metallic ones, often cut down your station’s reception distance. The console’s reception status displays at the lower right corner of the screen. • An “X” flashes for every data packet received by the console. • An “R” displays when the console is trying to re-establish a lost connection. console dashes-out any missing sensor readings. console into “R” mode, making the console manually exit “L” mode. Does the rain gauge need protection from freezing precipitation? It should not need any special protection from freezing precipitation. If the unit is displaying 'battery low' or 'battery failure' for Station 1, this means the external battery needs to be replaced. The part number for the lithium battery in the external unit is 34542-91.
down on the two latches at the top of the cover. 3. Replace the battery cover. My old Vantage pro had yellow jackets nest in the radiation shield. They would also end up in the tipping bucket of the rain gauge stopping the rain gage from working. You need to design a shield with a screen to keep yellow jackets, spiders and other large bugs from entering. The screen needs to have a large enough openings to allow air to enter the sensor area but keep large bugs out. May give inaccurate readings with frozen precipitation followed by freezing and thawing temperatures. Icicle formation can impede operation of tipping bucket. Winter temperature and precipitation regimes should be considered. I owned the Vantage Pro for nearly 8 years, until the transmitter board died and no replacements were available. I purchased a new Vantage Pro 2 from the company (excellent customer service/phone order), and set it up. (A little difficult to hook up the anemometer cable through the small hole in the RSS -- be patient.) The thing tested fine pre-installation but went belly up within 24 hours -- erroneous readings from rain gauge and then (when deinstalled an placed indoors) wildly erroneous 'outdoor' readings, suggesting that multiple sensors had soiled the bed. The company was great, though, and shipped another one (though I had to pay up front for the replacement and am waiting for my credit card refund for the return) -- again, great customer service, but a real inconvenience and so forth. I would just make sure that the readings you are getting are accurate based on local weather data. I live at 7400 Ft. Even with repeated Calibrating of both consoles they are poor for barometric pressure accuracy. I have a number of good sources of local pressure and all agree except the Pro2 consoles , and they greatly disagree. This is my third weatherstation for my home in over 20 years. My previous weatherstations were also made by Davis Instruments as I just replaced my Davis Weather Monitor II station on Dec 18, 2009 with the Davis 6162 Wireless Vantage Pro2 Plus. I have been very happy with all the Davis weatherstations I have previously owned. I would recommend the Davis 6162 Wireless Vantage Pro2 Plus to anybody who is interested in a quality home weatherstation.